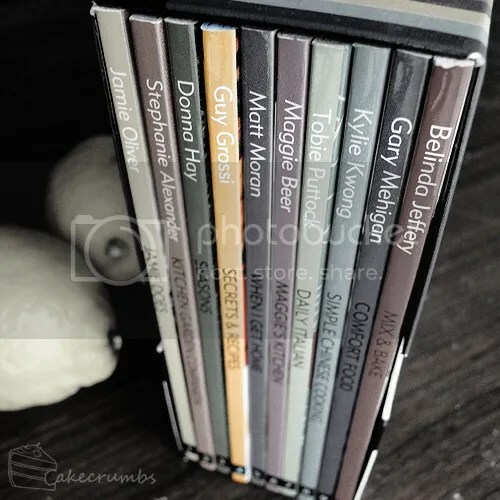 This week's cook book challenge comes for the 4th book in this mini series. 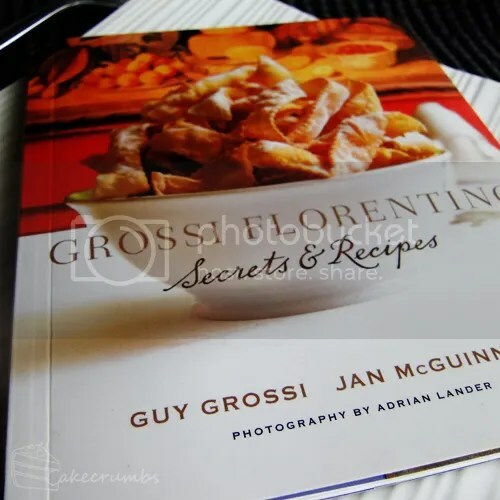 It's called "Grossi Florentino – Secrets and Recipes". Named after Guy Grossi's restaurant, this book was composed by its head chef as well and the journalist, Jan McGuinness. While the mini version of this book offers none of the history penned by McGuinness in the full version, there's more than enough recipes to peruse through. There's a lot to love in this book: something that made choosing a recipe really hard. It's packed full of the from-scratch pasta recipes you would expect, as well as some gorgeous meat dishes and more than a few delicious desserts. At first, the baked cheesecake was one I skipped right over. I'd wanted to made the cannoli, but in lieu of being able to find a single store that sold cannoli forms (I love it when they say, "Sorry, we just sold the last ones," all 4 times you visit), I handed the book to my boyfriend to choose. He delivered the ultimatum: it was cheesecake or lemon tart. 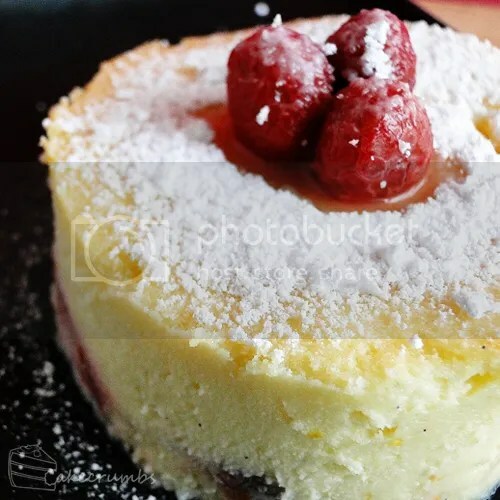 Baked cheesecake is one of my boyfriend's favourite desserts. When I started routinely baking years ago and asked him what his favourite cake was, he promptly replied with "marble baked cheesecake". We've been together over 5 years now and I was yet to try a baked cheesecake, so I decided I owed it to him to choose the cheesecake this time. There is clearly a lot I have to learn about baking cheesecakes. 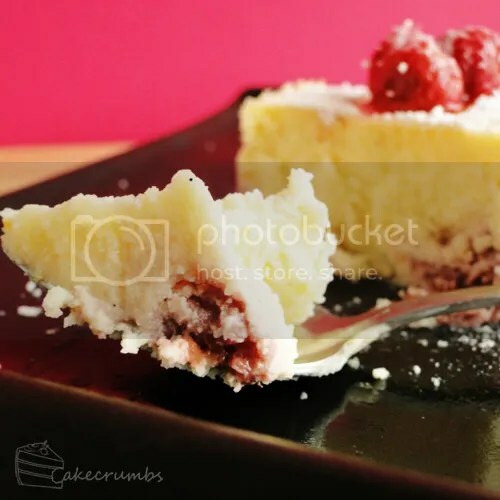 Like beat the eggs in last, and only as long as they need to to become incorporated into the mixture: the egg holds the air beaten into it, which will escape when baking and cause the surface of the cake to crack. Also, don't bake it with an hour and a half until boyfriend needs to go home. I'd neglected to factor in the cooling time required to set the cheesecake. So I slopped half of the hot cheesecake onto plates right out of the oven and cut a prettier slice today for the blog. The rest of the mess, now it has set, I will cube and top with something, perhaps a mousse or custard, and serve in tumblers. I'm not sure if my boyfriend is just super nice or really not picky, but he loved the broken mess of cheesecake straight from the oven. Maybe it's just because the flavours in this are so delicious. Grossi's recipe mentions nothing of the sort, but a good way too cool the cheesecake is to turn the oven off and leave it cool inside for an hour before removing from the tray to slice. You can then put it in the fridge if you like your cheesecake cold, though Grossi recommends serving it either warm or at room temperature. I put in a little more vanilla bean than he suggested, because I really love the flecks of vanilla seed throughout the dish. Preheat oven to 160°C (140°C fan forced). Lightly grease a 5cm deep rectangular baking dish (28cm x 21cm) and line it with greaseproof paper. Melt the white chocolate over a double boiler until smooth. Combine the cream cheese and sugar, then slowly add the melted chocolate, eggs, orange zest and juice and vanilla seeds. Pour half the chocolate mixture into the baking dish. Cover with raspberries and pour over the remaining mixture. Bake for 1 hour until just set. 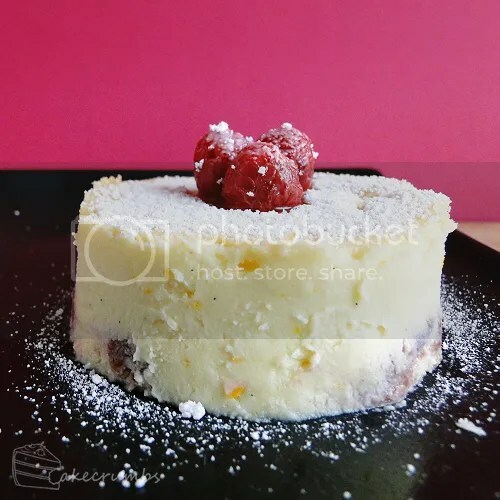 Allow to cool – the cake will become more stable and easier to cut. Dust with icing sugar and serve warm or at room temperature from the paper-lined dish.